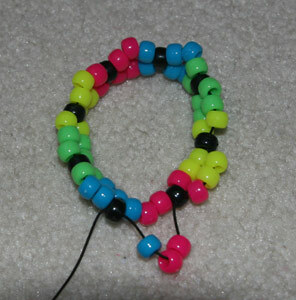 How to make kandi cuffs! This tutorial will teach you how to make a basic kandi cuff that can be turned into a 3D cuff if desired. This type of cuff is also called an X cuff because of the Xs that form. 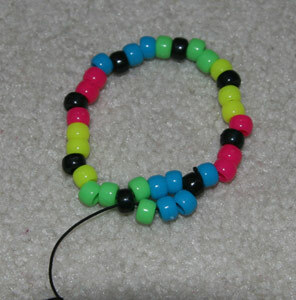 Supplies needed: (lots of) string, scissors, five different colors of pony beads, and 8 shaped beads (if possible). 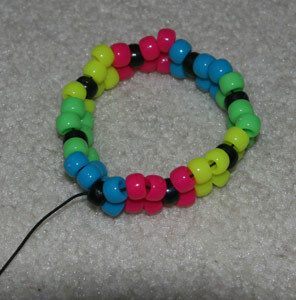 This cuff will be 32 beads around, which will fit someone with a small-medium wrist. If you need to make it bigger, increase with increments of 4. If you run out of string, click here to learn how to tie more on. Cut a long piece of string - as long as you are comfortable working with. You can always tie on more later. 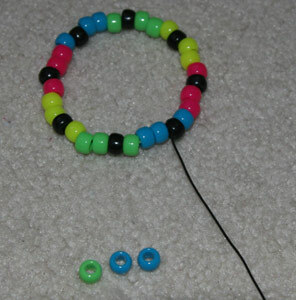 Then string 32 beads in the order shown below, and move the short end of the string to the right hand side. Tie the two ends together, making 2-3 knots. Cut the excess string from the short end, as close to the knot as possible. You should be left with one piece of string coming out of a blue bead. Pull the string through the nearest black bead. 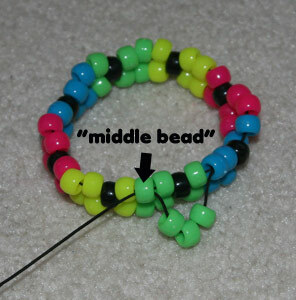 To make the second row, you'll be stringing 3 beads at a time, using the black beads as the "connector" beads - the beads you pull the string through. 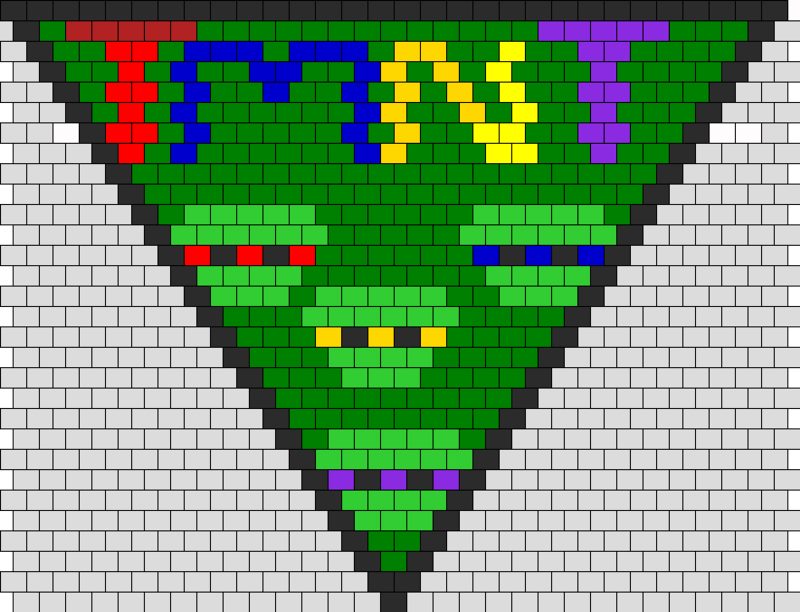 Just match up the bead colors with each section. 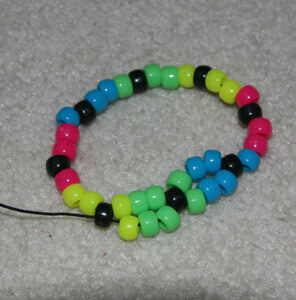 For the first segment, we'll first be stringing two blue beads, and one green bead. Thread the three beads, and pull your string through the next black bead. Pull the string tightly so the beads snap into place. 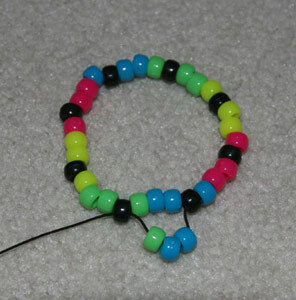 Thread the next three beads - which will be green, green, yellow, and then pull through the next black bead. Pull tightly again. Hopefully you can understand how the colors match up now. You basically just want the first and second rows to mirror each other. The next segment will go yellow, yellow, pink. The one after that will go pink, pink, blue. 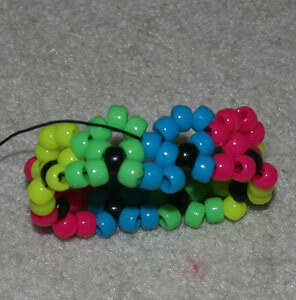 You'll know when you're at the end of the row because you'll have eight segments of three beads each, with black connector beads in between. When you get to the end of the row, pull through the next black bead as usual. Pull tightly, and you now have what's called a double. For the third row, we will again be stringing three beads at a time. But this time, we'll be stringing through the "middle bead" of each 3-bead segment. To start the third row, pull your string through the nearest middle bead (without stringing a new bead). For the third row, each three beads that we string will be the same color, and will match up with the bead that we string through (not from). 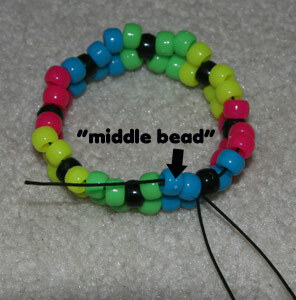 Pull the string through the nearest "middle bead," which should be green. Pull tightly. 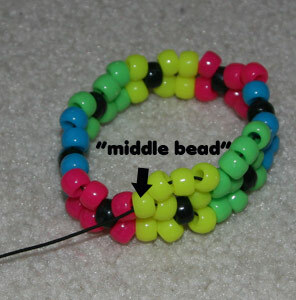 The next three beads you string will be yellow, because the next "middle bead" you'll string through is also yellow. Pull tightly. Hopefully you can see the pattern. 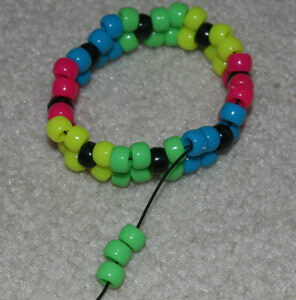 The next three beads you string will be pink, then blue, then green, etc.